Sybil is a VoomaGo Local in Dominica who lives by Calibishie in the North East side of the island. She was the first local I was introduced to upon arriving in Dominica during my visit in March of this year. 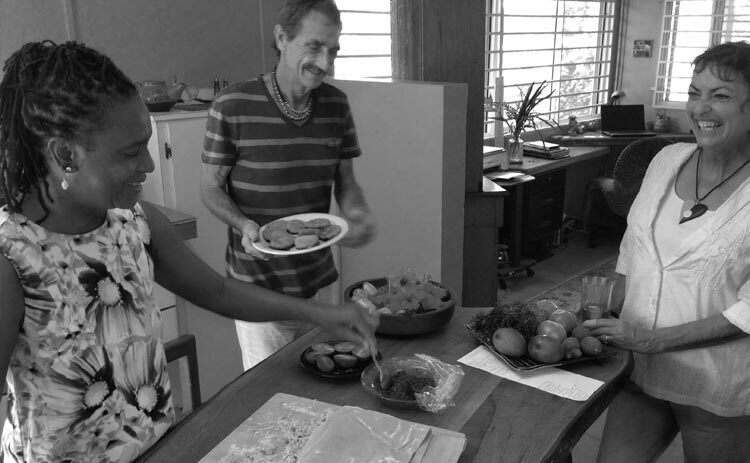 Her love for cooking and healthy eating is a magnet, learning from her a few secrets of Dominican cuisine and the health properties of each ingredient was a delight. Sybil is a fond believer of Hippocrates’ philosophy of letting “food be thy medicine and medicine be thy food.” She is a talented, passionate cook as well as a wellness expert, and she is happy to share her gift for creating sensational recipes. What makes Sybil special is her kindness and love for food, life, and organic produce. She speaks of her cooking like an artist would speak about his or her creations and I was very lucky to cook with her and share a fabulous unforgettable dinner and breakfast. I particularly enjoyed sitting down with Sybil to talk about wellness and healthy eating. What is the landscape of fresh herbs, spices and fruits of Dominica and what is so unique about them? Common herbs include thyme, rosemary, ginger, anise, parsley, garlic, turmeric, chives,seasoned peppers and hot peppers.The freshness preserves the flavor and potency of the herbs. They are used for seasoning foods from meats and fish to rice and provisions, such as sweet potatoes, beans, dasheen (taro) and boiled green bananas. They are also a major component of stews and broths. The spices include nutmeg, cinnamon, mace, annatto, (sometimes called roucou) and flavor drinks, baked goods, porridge and puddings. Rum drinks always include spicing and the cocoa tea is never complete without cinnamon and nutmeg added. Fruits include mangoes, sweet sop, pink grapefruits, carambola, wax apples, bananas, sapodilla, golden apples, guava and guava cherries, papaya, pineapple, apricot (different from North American) sometimes referred to as “manciport.” The fruits are varied in taste from sweet to tart to juicy and mouth watering, due to the volcanic soil and bountiful rainfall of Dominica. What is your personal cooking style? I come from a long line of chefs and wellness practitioners. My cooking is gluten and lactose-free, and I am a big proponent of raw foods. Cooking can destroy some of the nutrients and, often, the subtleties of taste. My goal is to encourage more raw foods into the diet. 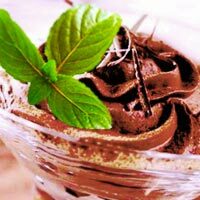 It’s not all about salads: there’s everything from chocolate avocado mousse (recipe below) to raw pesto pasta. What inspires you to cook every day? Tasty food is so nourishing to the soul, I get excited by the smells and taste of fresh food. My inspiration grows as I create new ways of using familiar ingredients and seeing what taste sensations evolve. 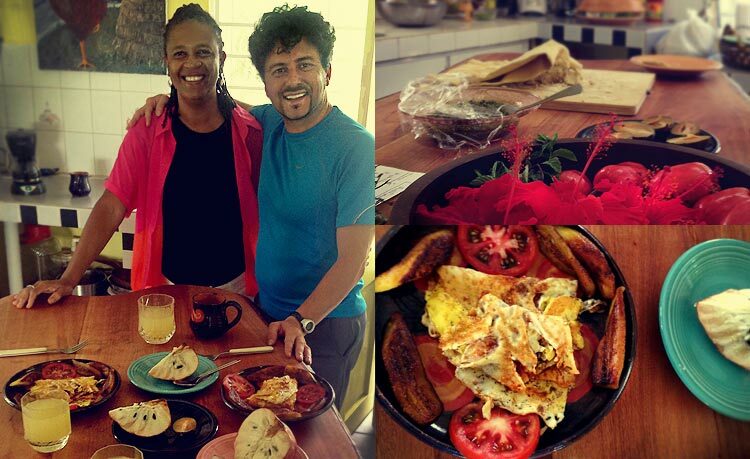 Are there any central ingredients that stand out when talking about Dominica’s culinary tradition? Cocoa, turmeric, ginger, tomatoes, seasoned peppers, avocados and citrus. 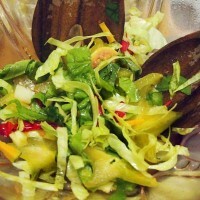 Dasheen and breadfruit, along with fresh coconut milk is central to many dishes. Fish steamed and particularly fish broths with lime are typical dishes. The spicing is a mix of Spanish, French and African and so the influences create a creole flavor. What are your favorite ingredients and herbs and why? Fresh fish, sweet potatoes, plantains, okra, coconut milk, turmeric, garlic, ginger. The combination of these creates a simple medley yet the flavors are outstanding together! What foods are a “must try” when traveling to Dominica? 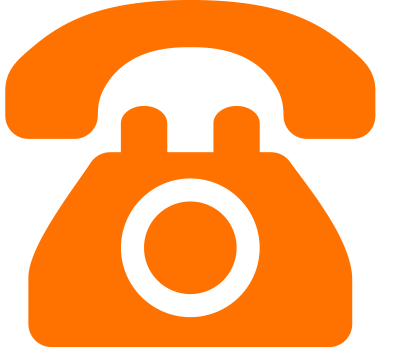 What is your favorite lesson to teach people that take your cooking classes? Have fun creating from what is in your garden or refrigerator, treat it like a puzzle that you piece together based on what it is at hand. Do not be afraid to experiment! What is your most meaningful food memory? It was a red delicious Canadian apple that we got every Christmas as a treat growing up in St. Kitts, the smell still lingers and the rich colour, texture of the skin and the sweetness inspired me to see food in all its glory. 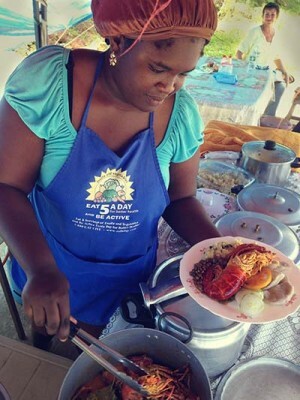 For those that are interested in experiential travel we have worked with Sybil to create an amazing afternoon where she shares her passion for cooking and eating healthy while teaching the local secrets and healing knowledge about many spices and herbs that the locals use. After the lesson you will join her on her veranda to enjoy the fruits of your labor for a meal with the organic, home-grown produce. Sybil is working on several cookbooks, and runs monthly classes on healthy eating and delicious cooking, and has graciously shared with us a couple of her favorite recipes. Click here for a PDF of Sybil’s recipes. Puree ingredients until silky smooth. Serve chilled and garnished with fresh mint leaves.